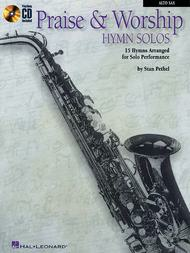 Praise & Worship Hymn Solos (Alto Sax) (15 Hymns Arranged for Solo Performance). Arranged by Stan Pethel. For Alto Saxophone (Alto Sax). Instrumental Folio. Hymns and Play Along. Difficulty: medium. Saxophone solo book and accompaniment CD. Standard notation. 16 pages. Published by Hal Leonard (HL.841375).ISBN 0793597560. With standard notation. Hymns and Play Along. 9x12 inches.15 hymns arranged for solo performance by Stan Pethel. Includes: Blessed Be the Name • Come, Thou Fount of Every Blessing • Fairest Lord Jesus • My Faith Looks Up to Thee • To God Be the Glory • We Have Heard the Joyful Sound • more.